Image caption Grace Mugabe's lawyer said the claims were "scandalous and malicious"
Grace Mugabe is suing a Zimbabwean newspaper over its reporting of claims released by Wikileaks she had made "tremendous profits" from the country's diamond mines. The president's wife is demanding $15m (£9.6m) from the Standard newspaper. The Marange fields in eastern Zimbabwe are said to be among the world's richest. Army commanders and allies of President Robert Mugabe have been accused of profiting from diamond sales. The Standard, a weekly paper, on Sunday reported the claims quoting a US diplomatic cable released by the whistle-blowing website, Wikileaks. It quoted former US ambassador James McGee as reporting Andrew Cranswick, head of a British mining firm as saying: "There is a small group of high-ranking Zimbabwean officials who have been extracting tremendous diamond profits from Chiadzwa [mine]". The cable names them as Grace Mugabe and Central Bank governor Gideon Gono, among other officials from the military and President Robert Mugabe's Zanu-PF party. 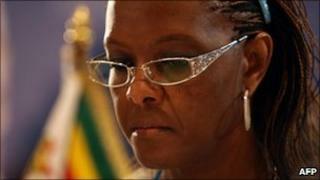 Mrs Mugabe's lawyer called the reports "false, scandalous and malicious". "The imputation of such conduct on a person of such high standing, the mother of the nation, is to lower the respect with which is held by all right-thinking persons, to a point of disappearance," said the court summons, according to the state-owned Herald newspaper. Campaign groups have long accused military officials of forcing local people to mine the diamonds, killing those who refused and not passing the profits to the treasury. Military and government officials have always dismissed such accusations. The BBC's Karen Allen in Harare says that, as delegates embark on Zanu-PF's annual party conference, the Wikileaks saga is likely to fuel calls from the party to break ties with its partners in the fragile unity government, and push for elections next year. President Mugabe agreed to share power with his former rival Morgan Tsvangirai after disputed elections in 2008. Mr Mugabe's government has had a troubled history with The Standard. The paper's editor was arrested earlier this month over a separate article which claimed that police were recruiting veterans of Zimbabwe's 1970s war of independence ahead of the possible elections.